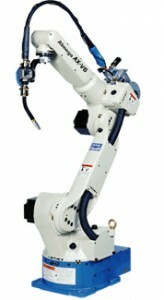 The AX-V6 is a high speed, smooth movement manipulator that shortens production time. 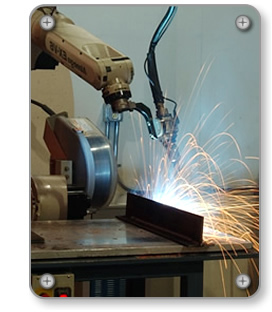 It is designed for MIG/MAG Welding, TIG Welding, Tandem MAG Welding, Alumium MIG Welding, and Plasma Arc Cutting. With such features as a built-in shock sensor in the welding torch and enhanced system configuration ability, the AX-V6 is ideal for high speed arc welding applications. Faster, yet smoother motion - reduced cycle time by new servo control system with advanced acceleration method. Independently articulated arm - no link arm to impede articulation for a full range of motion. Vibration restraining control - virtually eliminates vibration even when stopping at maximum speed.